The BMW i8 roadster is finally available for rent at Luxury Car Rental USA. You can rent an i8 roadster in Miami for a day, weekend or on a weekly basis. Get behind one of the coolest exotic car rentals in Miami. On the exterior new roadster looks almost identical to the i8 coupe except for the convertible soft top and some minor alterations on the concept like styling. 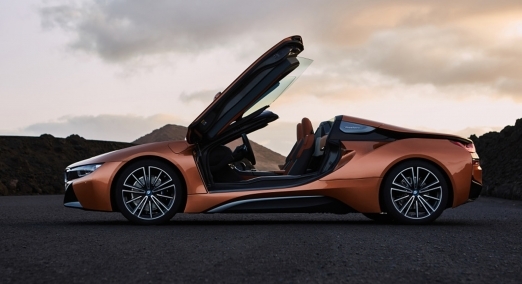 The convertible i8 keeps the iconic butterfly doors that open upward. When you drive the i8 roadster down to Miami Beach prepare to have people taking photos and asking questions about the car. Although the design has been around for several years now it still looks like it is a car from the future. The concept car design and scissor doors aren’t the only cool thing about this new i8 convertible. It has also been updated with more horsepower and new battery packs. The convertible hybrid sports car comes equipped with an upgraded 3 cylinder turbo engine and an electric motor that combined produce 369 horsepower engine. Also new in the i8 roadster rental is a longer range 11.6 kWh battery pack. 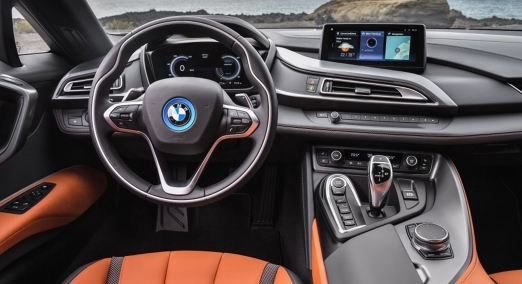 The electric engine produces 102 horsepower on its own and can propel the i8 up to 75 mph just on battery power. The new i8 roadster also has a new upgraded suspension system. The shocks and roll bars were both re-engineered to provide better handling. The new suspension also balances the i8 much better than previous models to provide less oversteering. Rent an i8 convertible and discover the latest BMW rental in Miami. The convertible i8 is one of the coolest exotic cars to look at both inside and out. The interior retains the same carbon fiber cockpit as previous models keeping the overall weight to a minimum. A futuristic design that makes you feel like if your inside of a ride at an amusement park. Although it is very plain it still looks very futuristic and contemporary. The i8 roadster is constructed using aluminum and carbon fiber reinforced plastic, this means the doors are 50% lighter than regular doors. Feel the rush of driving an i8 roadster down ocean drive with the top down. Rent a BMW i8 roadster in Miami today for just $1,195 per day. We offer free delivery to Miami International Airport and can have the i8 convertible waiting for you outside of your terminal when you arrive. You can rent an i8 roadster in Miami for a day or drive it around Miami Beach all weekend. There are special prices for rentals of more than one week as well as long-term monthly rentals. Delivery is also available to your hotel, business or home in Miami Beach, South Beach, Brickell, Downtown, Wynwood, Midtown, Doral, West Palm, Fort Lauderdale, Key Biscayne and even Orlando. We are dedicated to providing you with the easiest i8 roadster rental solution in Florida.